We have an exciting two day sailing regatta starting on New Years Day. Its called the Bull Reg Regatta named after the famed Bahamian Sloop boat builder “Buzzy” Rolle. If your in Exuma at that time don’t miss this event which races over a triangular course all set in the picturesque setting of Elizabeth Harbour. 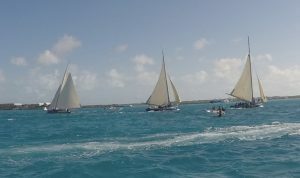 See boats from many Bahamian islands compete in this prestigious event.